Whose Michigan Basketball Team Is This? Brandon F. Quinn, Michigan Basketball Beat Writer for MLive penned this very good article after Michigan's loss to Iowa yesterday afternoon. The central theme is that Michigan is deferring too much to Zak Irvin and Derrick Walton Jr. at crunch time when this has clearly become DJ Wilson and Mo Wagner's team. 1. I give Coach Beilein a ton of credit for playing two bigs at the same time for most of the games this year (something that he has been reluctant to do for his entire tenure at Michigan). I have long thought that the true sign that a coach is a good coach is that he or she is constantly trying to get better and adapt to changes in the game (a certain Lion's coach could learn from what Beilein has done this season). I also commend Coach B for bringing in a new defensive specialist as an assistant. Michigan's biggest deficit since Trey Burke and Jordan Morgan left were guards who could stop penetration and bigs who could consistently defend and help effectively. Now, in my humble opinion, Michigan's defense is still flat terrible at stopping penetration (and at help D) but at least they are trying to improve the defense. 2. Quinn is right to question Coach Beilein's assumptions about his deference to his older players as end-of-game heroes. Zak Irvin has improved every year but questionable judgment on offense has always dogged him and he has never developed the consistent all-around game that Burke or Stauskas grew into. He is a very good player (as a defender in particular) but as of yet, he has never really turned the corner and become a transcendent player. Derrick Walton Jr. is and always has been an enigma to me. I have seen games throughout his career at Michigan where he was a plus defender, a serviceable scorer, and a better than average assist man. Unfortunately, it is the rare game where any of these skills come together at the same time and he has always been prone to disappear (often for entire games). 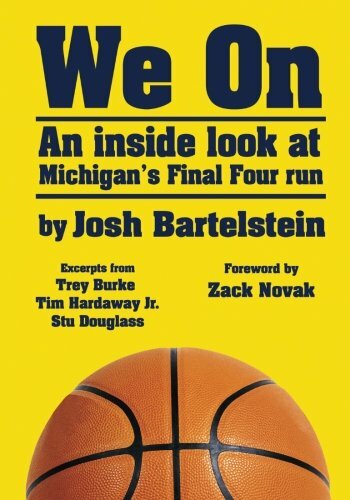 I get that Beilein runs a complex offense that he trusts Walton Jr. to run, but that was Derrick who crushed Michigan's chances with the ball and the clock running down at the end of regulation. He has the experience, but I just don't see him being the guy you want with the ball in his hand at the end of games. I hope that changes, trust me, nobody wants Derrick to become a transcendent point guard more than me. Look, I will fully admit my basketball days are way behind me (I played in HS and coached a little). I will also admit that Coach Beilein has forgotten more basketball than I will ever know. I suggest this is in the spirit that maybe a separate set of eyes sees something good every once in a while. Right now, Michigan is playing DJ Wilson virtually every important minute of every game. As Quinn noted, by the end of the Iowa game DJ was totally spent. Mo Wagner is electric on offense but tends towards fouls on defense. Part of this is because neither DJ or Mo are naturally 5's (they both project as stretch 4's in the league I would suspect). I get that it makes Michigan very dangerous to have DJ and Mo on the floor at the same time at the end of the game. However, changing the rotation for much of the rest of the games might help. I am suggesting that it might help both of them if Beilein changes the rotation so that Donnell (Mark Donnell is only getting 3.2 rebounds per game in 19 minutes as a Senior...That is awful) and John Teske man the 5 for much of the game while DJ and Mo spell each other at the 4. You still get all of the benefits of having two bigs (rebounding and defense), DJ gets more rest so that he has energy at the end of halves, and Mo is put in less fouling peril at the 5. I know that Beilein is reluctant to play underclassmen significant minutes. Personally, I think Teske would benefit from the minutes and would improve quickly. Even if his time on the floor is negative, it buys time for DJ and Mo while allowing him the experience which will pay off down the road in meaningful Big 10 and NCAA games (and to be fair, we could benefit from seeing a bit more X Simpson too). At the very least, it would help with rebounding and interior defense. I am probably crazy. But the Big 10 season, more than in any other conference, is a grind for bigs. The Big 10 is a smashmouth league. Conference games are wars. I get that Beilein is a finesse coach in a physical conference. I guess what I am suggesting is that he keep the finesse players fresh for the end fo the game and use his minutes more strategically. It might cost us a bit in the short term, but I suspect it will pay off in the end. In short, I would play more traditional 5's for most of the game, play Mo and DJ in crunch time, and defer more to Mo and Dj when the game is on the line. All that said, what do I know :)? I am one of those fans who, win or lose, will watch (or listen) to every game and attend whenever I can. Go Blue! What do you think is the answer for Michigan Basketball? How Michigan basketball improve its defense?